The top-seed North Carolina Tar Heels are looking for their seventh national championship in program history, and they'll meet a 5-seed Auburn Tigers squad on Friday that hasn't been to the Elite 8 since 1985. But that history won't mean much when this 2019 NCAA Tournament Sweet 16 game tips at 7:29 p.m. ET in Kansas City. Both teams have covered at least 20 games this season and beat the spread last time out in the Round of 32. The Tar Heels are 5.5-point favorites in the latest North Carolina vs. Auburn odds after the line fell as low as 4.5, while the total is 165, up five from the opening line after sharp action on the over. 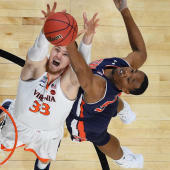 Before locking in any North Carolina vs. Auburn picks of your own, see the 2019 NCAA Tournament Sweet 16 predictions from the proven projection model at SportsLine. This model, which simulates every game 10,000 times, has raked in the winnings for those following its picks. Over the past two years, the SportsLine Projection Model has returned over $4,000 to $100 players on its top-rated college basketball picks and entered the postseason on a strong 11-5 run on all top-rated college basketball picks. It's also on fire in the 2019 NCAA Tournament, calling all but two of the Sweet 16 teams this year. Anyone who has followed it is way up. Now the model has dialed in on North Carolina vs. Auburn. We can tell you it is leaning under, and it has also generated a strong against-the-spread pick that cashes in well over 50 percent of simulations. That one is only available at SportsLine. The model has taken into account UNC's impressive mix of veterans and newcomers that have helped the Tar Heels surge to a strong second half of the season. Seniors Luke Maye (14.9 points per game) and Cameron Johnson (16.9) provide plenty of experience. Freshmen Coby White (16.1) and Nassir Little (10), meanwhile, don't have the same level of experience, but both are potential 2019 NBA lottery picks. That core group helped Roy Williams' club win eight straight in late February into March before falling by one point to Duke in the ACC Tournament. The Tar Heels have rebounded well since that point, blowing out 16-seed Iona (88-73) and 9-seed Washington (81-59) in the first two rounds of the 2019 NCAA Tournament. But the Tar Heels are about to meet another offensive juggernaut, so there's no guarantee they'll cover the North Carolina vs. Auburn spread and advance in the 2019 NCAA bracket. The Tigers (28-9) have won 10 straight and put up eye-popping numbers in the process. They average just under 80 points on the season, but they've found a new gear recently, averaging 83.6 per contest in their last three games, a span that includes wins over Tennessee, New Mexico State and Kansas. And while the Tigers were lucky to survive that first-round game against New Mexico State, their dominant 89-75 victory over Kansas in the second round proved they are a legitimate Final Four threat. Bryce Brown (15.9 points per game) and Jared Harper (15.3) provide most of the scoring for Auburn, but with six regulars who hit at least 35 percent of their 3-pointers, the Tigers have plenty of options. So who wins Auburn vs. North Carolina? And which side of the spread hits in well over 50 percent of simulations? Visit SportsLine now to see which side of the Auburn vs. UNC spread to jump on, all from the advanced model that is up more than $4,000 on its college basketball picks, and find out.